Dundee striker Derek Lyle has agreed a pre-contract deal with First Division promotion rivals Hamilton Accies. 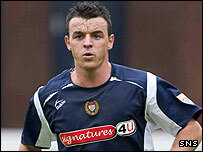 The former Partick Thistle and Queen of the South forward bagged 15 goals for the Dens Park club last season. And Lyle has helped himself to five more goals during the current campaign as Dundee and Hamilton fight it out at the top of the table. Lyle will move to New Douglas Park in the summer unless the clubs can agree a fee before the end of January. The striker will not be in action for Alex Rae's team this weekend as he begins a three-match suspension.